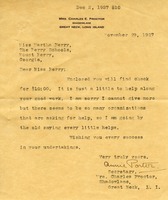 Mr. Harvey requests shuck door mats that were made at the Berry Schools. 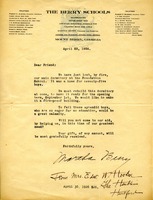 Letter to Ralph Allen from Martha Berry asking him to come visit the schools. 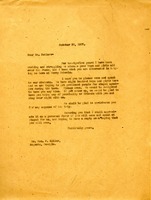 Letter to the Social Register Association from The Berry Schools. 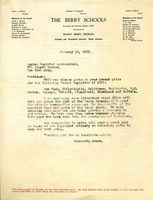 This document is a letter from the Members of the Board from The Berry Schools to the Social Register Association in New York in which The Berry Schools ask for quotes concerning the lowest prices for numerous Social Registers in different cities. The document proceeds to talk about how the schools have educated thousands of rural southerners and ends with a request for any amount of money. 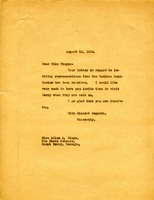 The next paper represents a picture of Georgia that shows where Mt. Berry is as well as naming the Executive and General committees. 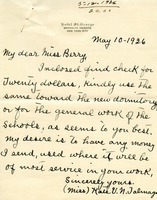 This is a donation letter to the Berry Schools from Mrs. Charles Proctor for a $10.00 gift. 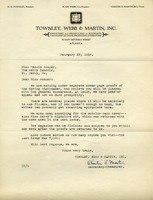 A Letter to Mr. & Mrs. Charles G. Taylor from The Berry Schools concerning the Taylor's home addresses and whether they are correct or not. 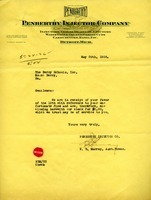 At the bottom of the letter, there is a note concerning a change in one of their addresses. 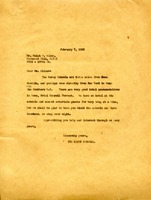 In this letter W.E. Murray on behalf of the Penberthy Injector Company tells The Berry Schools that they are sorry for the fire and that they are sending five dollars to help with rebuilding. Mr. Hoge thanks a donor for a generous gift during a fundraising campaign.